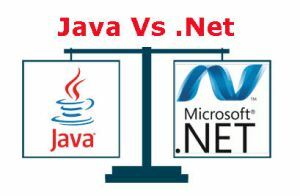 It is very difficult to rationalize which is better Java or dotNet. Both have their points to back up. Java’s tag line “Write once; Run anywhere.” says just go the way as provided by me and I assurance, you can run it anywhere and will get the same result, while on opposite dotNet’s tag line “Write in any language; Run on Windows.” says hey!! come and use any language you are comfortable with and I assure you, you will get the same result. Java facilitates a variety of web servers to run its web application while dot net supports IIS to host Asp.net applications. Not many options are available in case of dotnet. Java is a programming language while dotnet is a framework which supports multiple languages to run on windows platform.